Choose a giving level below. Please note, you may designate your contribution to no more than two specific sports programs listed below. If no designation is made, your contribution will benefit general athletics. Payment in excess of $25 is tax-deductible. If you indicate below that you do not wish to receive the items listed in this wolf pack, your total contribution will be tax deductible. Payment in excess of $50 is tax-deductible. Payment in excess of $100 is tax-deductible. Payment in excess of $150 is tax-deductible. Payment in excess of $250 is tax-deductible. Beloved former Northwood football coach, athletic director and mentor, John B. "Jack" Finn, passed away on Friday, May 24, 2013 surrounded by his family. Finn joined Northwood for the 1968/1969 school year as head football coach and athletic director. He spent 18 seasons in the dual role of athletic director and head football coach and had a record of 87-74-6 with three Great Lakes Intercollegiate Athletic Conference championships. He produced 14 All-American and 44 All-Conference players in his tenure at Northwood. As the Northwood athletic director, Finn was instrumental in affiliating Northwood nationally with the National Association of Intercollegiate Athletics and served as chairman of NAIA District 23. He was a member of the NAIA football rating committee and was an administrator for NAIA football playoff games. He also helped found the Great Lakes Intercollegiate Athletic Conference in 1971 and served as the league's first president. 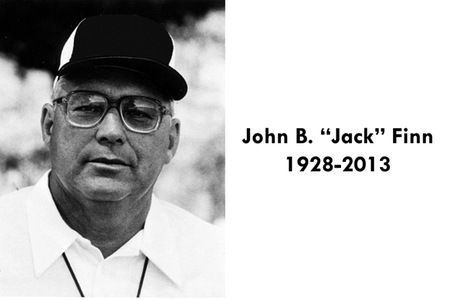 Jack retired as head football coach at Northwood following the 1986 season, but remained as NU's athletic director until retiring from the university in 1989.